Tools in Spine are found in the Transform and Tools sections of editor area toolbar. Right clicking anywhere in the editor area will toggle between the current tool and the last selected tool. This makes using multiple tools more efficient because it is much faster than clicking the toolbar buttons. Instead of a dedicated selection tool, Spine uses a smart selection system. Selecting an item in the editor area is done by simply clicking the item to select. To select multiple items, hold ctrl (cmd on Mac) and click each item. To box select, hold ctrl (cmd on Mac) and drag. When nothing is selected, box selection can be done by without holding a button. Clearing the selection is unnecessary most of the time but can be done by pressing escape, spacebar, or by double clicking in the editor area. This can be useful just before using box selection. Selections can be stored by pressing ctrl+1 (cmd+1 on Mac), where 1 can be any of the number keys, 0-9. The selection can later be recalled by pressing the number key without holding ctrl or cmd. Selection groups can greatly speed up posing a skeleton. For example, for a humanoid skeleton selection groups can be stored for the torso, head, arms and legs. The Rotate, Translate, Scale, and Shear tools each work in the same way. The selected item is adjusted by dragging the mouse. The drag should start in empty space or on the item itself. If the drag starts on a different item, that item will be selected and adjusted. This makes makes adjusting items quick and precise, without requiring tedious interaction with small control handles. Each transform tool has a numeric display whose values depend on the selected axes. New values can be typed and will take effect when enter or tab is pressed. Relative values can be entered be starting the number with +, for example +123. Relative negative values must also start with a plus, for example +-123. The mouse can also be used to change the value by scrolling the mouse wheel while over the number or by dragging up or down. Hold shift while using the mouse wheel or dragging to adjust the value in smaller increments. The arrow keys can be used to change the value for the selected transform tool. Hold shift while using the arrow keys to adjust the value in smaller increments. The Local, Parent, and World axes determine the numeric values shown for the rotation and translation, as well as the direction of the axes shown in the editor area. This gives more control over how items are transformed. How the active axes affects each transform tool is explained below. Bone and vertices transforms can be copied by selecting one or more bones and pressing ctrl+C (cmd+C on Mac). The transform can later be applied by selecting one or more bones and pressing ctrl+V (cmd+V on Mac). This sets the rotation, translation, scale, and shear to the copied values. The hierarchy of the bones is used when applying the copied transforms. Which axes are selected affect what happens when bone transforms are pasted. World makes the bones match the copied world transform values and Local makes them match the copied local transform values. 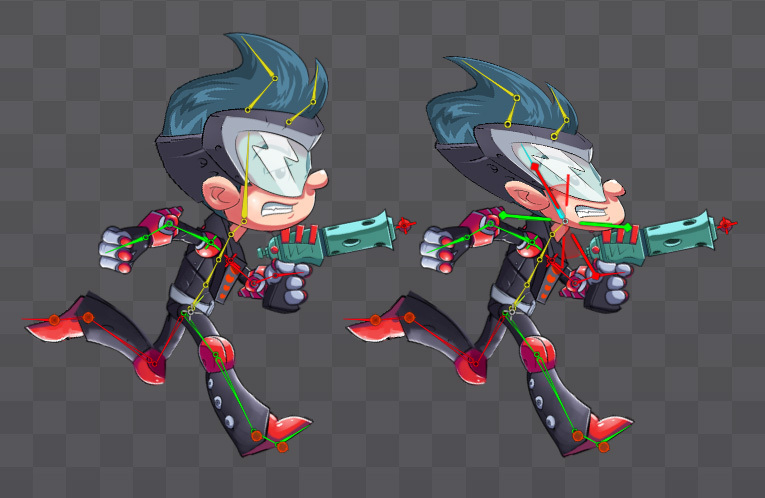 Copying bone transforms can be useful to make one limb match another, or for copying all or part of a pose from one animation frame to another. Copying vertices transforms will work for meshes, paths, and bounding boxes. The vertices can even be pasted to a different attachment, as long as the same number of vertices is selected. The pivot point for rotating a bone is always the bone's origin. shift can be held while dragging to constrain rotation to 15 degree increments. Rotation in Spine is always normalized between 0 and 360 degrees. See keying rotation for rotating more than 180 degrees in an animation. Local or Parent: The value is the counterclockwise rotation relative to the item's parent, where 0 is pointing the same direction as the parent's X axis. World: The value is the counterclockwise world rotation, where 0 is to the right, 90 is up, 180 is left, and 270 is down. The X or Y handles on the Translate tool icon in the editor area can be dragged to restrict translation to a single axis. Local: The value is the distance to the item's parent using the item's local axes. The X axis points in the direction of the item's rotation. Parent: The value is also the distance to the item's parent, but using the parent's local axes. The X axis points in the direction of the parent's rotation. World: The value is the distance to the world origin. Translating multiple bones by Local or Parent axes can be useful to move the bones in different directions the same amount. For example, to make both arms longer. Here the lower arms have been translated along the parent's X axis by choosing Parent axes and then dragging the red X axis arrow on Translate tool icon. The X or Y handles on the Scale tool icon in the editor area can be dragged to restrict scaling to a single axis. Scale is always applied using the item's local axes. The X axis (red) for scaling always points in the direction of the item's rotation. 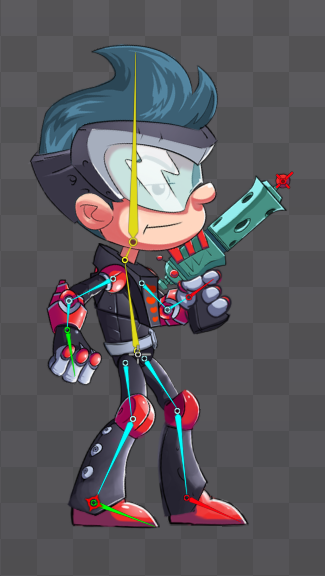 Here spineboy's torso has been scaled down. The child bones of the torso inherit the scale from their parent and are also scaled down. 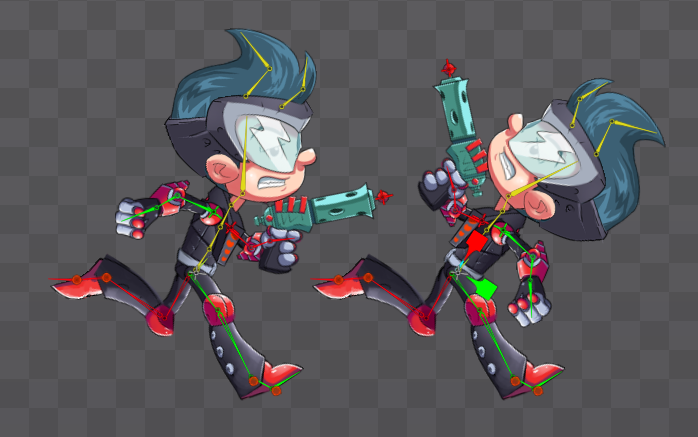 Here spineboy's torso has been scaled down, but only on the Y axis (green). When the X and Y scales have different values, it is called nonuniform scale. The child bones inherit the scale as before, but since the parent scale squashes them in the parent's Y direction, the child bones are sheared (skewed). The Y axis is normally 90 degrees to the X axis. Here spineboy's arm is selected to show that the parent scale has sheared the arm, changing the angle between the X and Y axes. 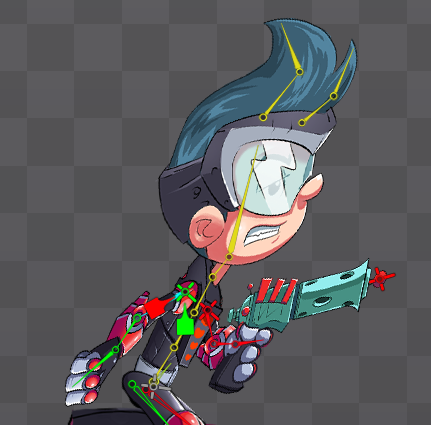 Here spineboy's torso has been scaled on Y to -1, which causes the Y axis to point in the opposite direction. The child bones are not sheared when the X and Y scales are any combination of 1 or -1. Scale always uses the item's local axes. The X axis points in the direction of the item's rotation. The X or Y handles on the Shear tool icon in the editor area can be dragged to adjust the angle between X and Y axes. Similar to scaling, shearing causes child bones and attachments to deform and is most commonly used in small amounts for organic squash and stretch in animations (see spineboy's head). The deformation from shearing differs from scaling and can help animations from looking rigid or robotic. The deformation from shearing can be applied to a whole hierarchy of bones and is easier to apply than deforming a mesh manually or using weights. Also, shearing is available in Spine Essential while meshes and weights require Spine Professional. In setup mode and when any transform tool is active, placing the mouse over the tip of a selected bone allows the bone's length to be adjusted. 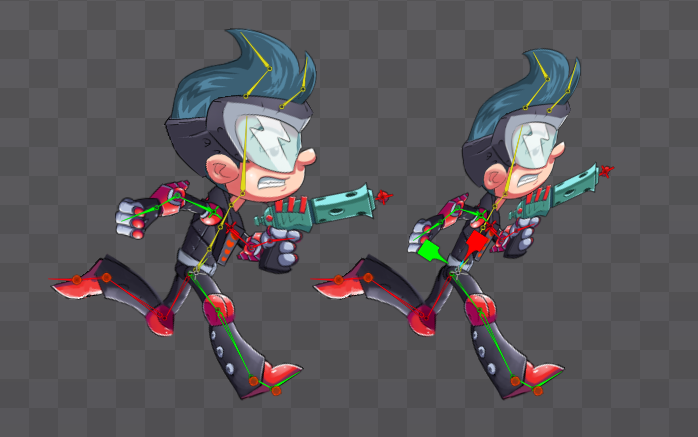 Multiple bones can be adjusted at the same time. The bone length can also be adjusted numerically in the bone's properties at the bottom of the tree view. Here the length of the sword bone is being adjusted. The Pose tool can adjust both bone translation and rotation. This allows for quick bone manipulation without switching tools. While most other tools work by selecting a bone, then dragging in empty space to manipulate the bone, the Pose tool requires handles on the bones to be dragged. To translate a bone, mouse over the bone's origin and drag the translation icon that appears. Even if multiple bones are selected, only the bone that is dragged is translated. For a zero length bone, the translation icon won't appear if the bone is selected. To rotate a bone, mouse over the bone and drag the target icon that appears at the bone's tip. The bone will rotate to point at the target. When multiple bones in the same bone hierarchy are selected, inverse kinematics (IK) is used to adjust all the bones until the tip of the last bone reaches the target. Here the tail is being adjusted by the Pose tool. Multiple sets of bones that do not have a common parent can be adjusted without losing the selection. Here both arms and legs are selected. Any selected bone can be dragged to adjust only that limb, without losing the selection of the bones that aren't being adjusted. Clicking in empty space deselects. Dragging in empty space does box selection, making it easy to select multiple bones. The Weights tool is used in combination with the weights view to set the influence of bones on the vertices in a mesh. See the Weights view for more information. The Create tool creates new bones, which can only be done in setup mode. Before creating a new bone, first select the bone that will be the parent. Next, press the left mouse button where you want the bone to start, then drag to set the bone's length. Alternatively, you can click to create a zero length bone. The length of a bone is usually cosmetic, except when using IK constraints, path constraints, or auto weights. 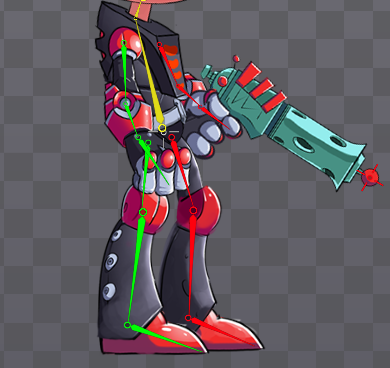 A zero length bone is drawn in the editor area using a crosshair icon instead of as a bone, but is otherwise exactly the same as any other bone. When choosing where to create bones, keep in mind that bones pivot around their origin when rotated. There are no limitations for where a bone is created. Child bones are not required to have their origin at the tip of the parent bone. Usually attachments for a new bone are already in the editor area as a reference for where to create the bone. After selecting the bone that will be the parent and before creating the new bone, hold ctrl (cmd on Mac) and click to select one or more attachments. When the new bone is created, the slots for these attachments are moved to the new bone and the new bone is named using the slot of the first attachment selected. This greatly reduces the time needed to setup a skeleton. To easily fix a bone that is not quite in the correct position, select the bone, then hold alt (option on Mac) and drag or click to recreate the bone. Any child bones or attachments will be unaffected. After a bone is created, normally the new bone is selected. To create a sibling of the new bone, the parent bone must be selected again. If shift is held when creating a bone, the new bone is not selected, which makes it easier to add multiple sibling bones. The color for each bone can be set in the properties at the bottom of the tree. This can help to differentiate groups of bones and make selection much easier. 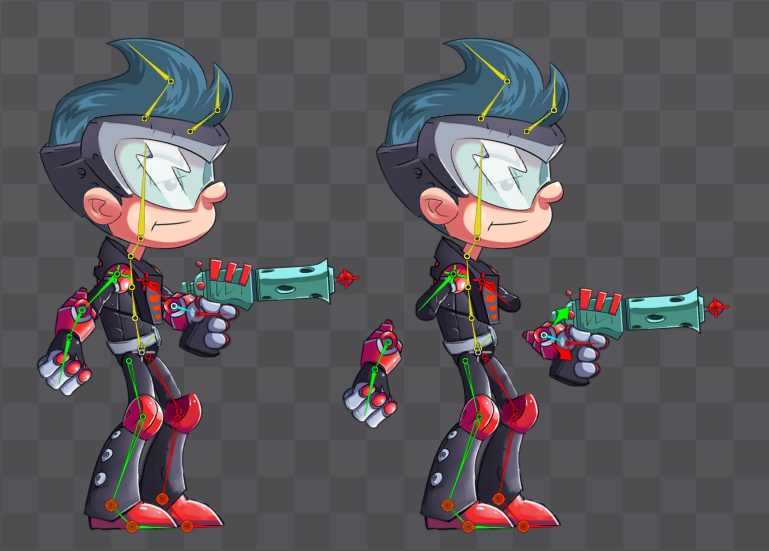 For example, for a humanoid skeleton the back leg and arm can be colored differently from the front leg and arm. Normally when a bone's transform is adjusted, any attachments and child bones are also affected. Compensation allows a bone to be adjusted without affecting the attachments or child bones. For example, this can be useful to move a bone to change where it rotates without moving attachments or child bones. To move a bone without affecting its attachments, first enable image compensation. This transforms the attachments an opposite amount so they appear to not have changed at all. This works for all attachments in setup mode, but in animate mode some attachments cannot be transformed. 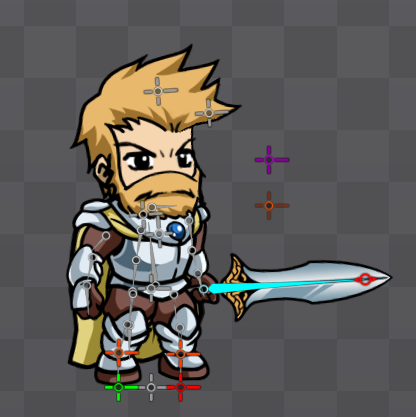 For example, image compensation will work in animate mode for mesh attachments but not region attachments. To move a bone without affecting child bones, first enable bone compensation. This transforms the child bones an opposite amount so they appear to not have changed at all. 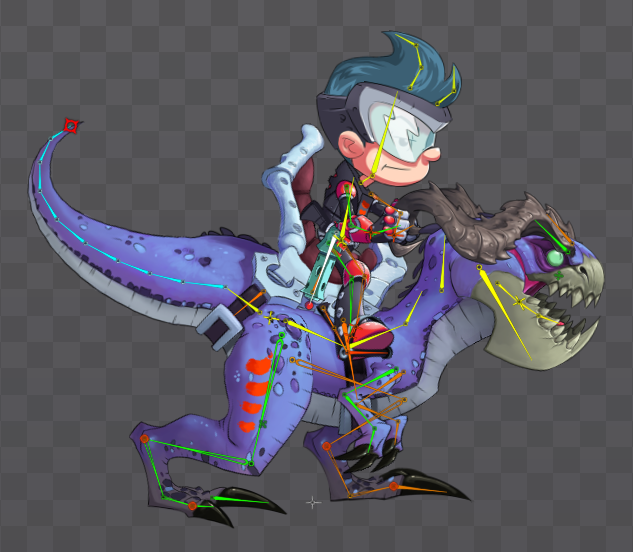 In animate mode, the changes bone compensation makes to each child bone must be keyed. Interpolation between keys may still cause the child bones to move. Be sure to disable compensation when it is no longer needed to avoid confusion. If a bone has nonuniform scaling (meaning the X scale is not the same as the Y scale) then, due to how attachment positions are described, image compensation may not be able to adjust attachments so they appear not to move. The options panel provides convenient access to disabling selection, visibility, and name tags for bones and attachments. The first column controls whether bones, region and mesh attachments, and bounding boxes can be selected. This can make some tasks easier by preventing accidental selection. The second column controls visibility of bones, region and mesh attachments, and bounding boxes. 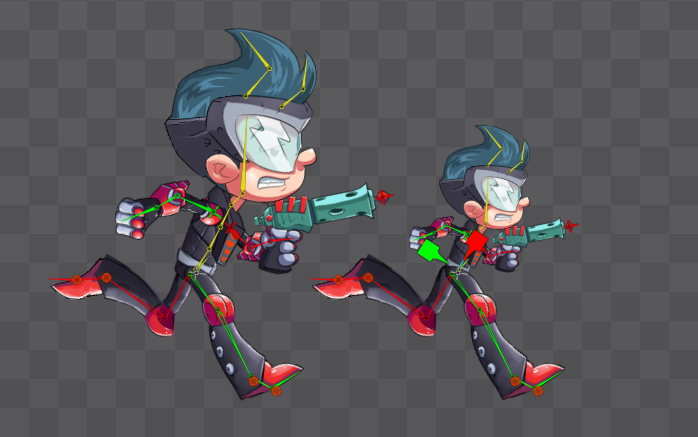 It is often useful to hide bones to reduce clutter while animating. When bones are hidden, they can still be selected and appear when under the mouse cursor. The third column controls visibility of name tags for bones, region and mesh attachments, and bounding boxes. Name tags increase the amount of clutter for complex skeletons, but can make it much easier to find a specific bone or attachment.